Sometimes changing the tune even just a little bit is all that’s needed to bring in more fans. Perfume Genius attempts to do this with fourth album No Shape, which is a subtle but effective diversion from Too Bright’s lo-fi and pop arrangement. No Shape is more instrumental, with a strong presence of piano, guitar, and many other instruments that I cannot possibly identify. When I mentioned “more fans” in the first line, I mostly meant myself because no matter how many attempts I made, Too Bright simply did not appeal to me. However, the music arrangements in No Shape create an eerie balance alongside a distressed and lost character in the midst of great change. If there is any song that can make me doubt about dismissing anyone, it’s “Slip Away.” It’s not only a terrific song, but one where each and every step is both beautifully crafted and chaotic. The music is mechanical, like a lumbering machine unencumbered by disaster. This contrasts well against Mike Hadreas’ airy vocals, giving credence to the distress of the situation and futility of love breaking “the shape we take.” Considering the album is called No Shape, the circumstances are made quite clear. “Just Like Love” is a perfect example of how taking a more instrumental direction allows for a more diverse listening experience. Where Too Bright’s music was as airy as it’s singer, No Shape goes for more stronger sounds. A high-toned keyboard switches quickly to a bass arrangement followed by an electric guitar that’s smoked too many guitars. The progression of the song is unpredictable, which is really exciting. You want to finish the song just to figure out what comes next. “Sides” is a special collaboration with Weyes Blood where they play a frustrated couple. Hadreas plays a boyfriend trying to break through the emotional barriers of their significant other, where the struggle is heightened by an anthemic guitar arrangement. Blood steps in for a more tranquil part of the song where her melodic vocals sing how “it ain’t easy to love” her. This is turned on its head when both join to say “baby, it ain’t easy to love,” showing that they both have trouble with their side of the relationship. Every single song has its own signature. “Go Ahead” is a stomping ground of giants, “Valley” is pure whimsy, and “Choir” is a fast-paced violin that drowns Hadreas’ vocals. 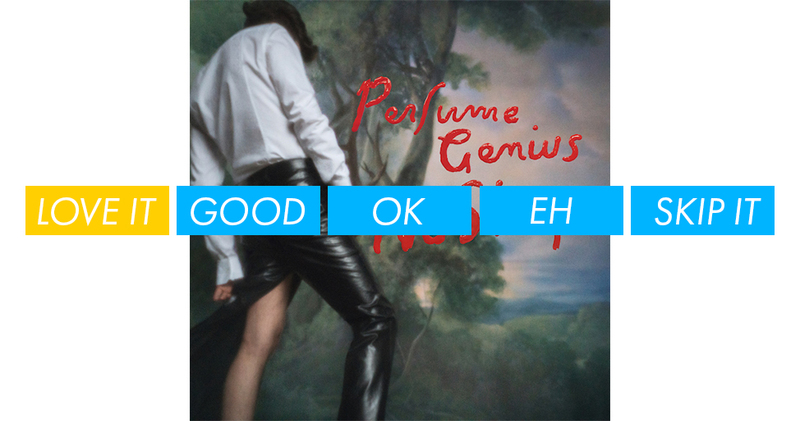 Perfume Genius has really refined his craft by making his fourth album more of a classical piece than a pop album. It’s energetic, adventurous, and dangerous. It certainly helps that he brought on producer Blake Mills, who also worked on Laura Marling’s Semper Femina, whose imprint of dark atmosphere and heavy instrumental production is very much present. This isn’t to dismiss Hadreas’ contribution, but more to praise how everything, from his performance to the overall production, is just right. No Shape is an emotional collapse of broken pianos and earnest yearning…that’s a compliment. LOVE IT. After Laura Marling’s release of Short Movie, a tale of her time in the United States, there was a question over what direction she was going to take. Unlike her previous works, Short Movie was a far more light-hearted and electric guitar-heavy production. Was she going to continue in this route or was she going to return to the more acoustic yet strange songs of her past four albums? 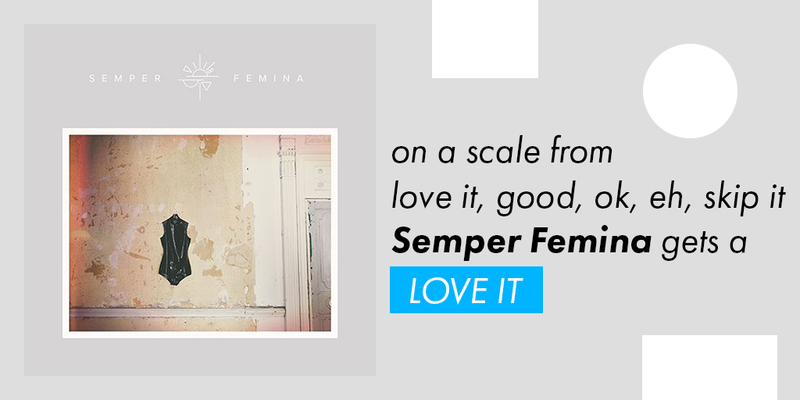 The answer is a bit more complicated than that, as Semper Femina is not a retread of any of her work. Laura Marling is evolving her talents and venturing new grounds, while using her past works as a jumping off point. The light-hearted Marling looking for answers in Short Movie becomes a contemplative and distressed narrator still looking for answers, but nowhere near ready to reach a restive conclusion as she has done in previous album. She fully accentuates her emotions, however happy, sad, raw, or emotional as they are, and she’s never sounded better. “Soothing” strikes your head and never apologizes. It is stuck in a moment of great harrowing sadness and distress. The speaker is breaking from a figure she once knew, someone who lived with her. Now, all that’s left is a “creepy conjurer” watching over her, feeding the anxiety-filled madness of the senses. Her pain can be felt not only through her words, but by the deep chords of the bass, emphasizing the distraught of Marling’s echoing words. What adds to the sharpness and darkness of “Soothing” is how much the following song, “Valley,” is a calm acoustic song about love that is far away but physically, within reach. The song’s premise may not sound any happier, but Marling sings the lyrics with serenity. When she remarks how she “will do [her] very best,” there is a real optimism that good things will come. This song is not just important for what it is, by itself, but in its placement. It’s disorienting switching from a strong bass-filled song about discomfort and sadness to a song about a calm reflection on love. This may in fact be a point in Marling’s favor. It opens the album to uncertainty. In the first two songs, alone, it is clear that this is not an album about a journey. There are many layers to go through and so many are unexpected. “Wild Fire” is special in that it is mostly depicting the narrator talking about a girl that she loves and, in doing so, gives a far clearer picture of the narrator than the girl. The girl is shown as a writer with a lot on her mind. That’s about it in terms of a concrete description. The narrator makes a point that the girl’s parents have problems, but that could easily be coming from a singular perspective. In addition, the narrator’s interest in the girl’s writing skills is to read about how she’s depicted. In the bridge, Marling sings out “Do you cry sometimes?” This question, and the way it’s sung, appears to be directed at the wrong person. “Wild Once” is an empowerment song, and a quiet one at that. It inspires the narrator, through a ritual of sorts, to remember that she was wild, “chasing stones”–a line powerful in its primitiveness. There is an encouragement to not change in the face of a strong force, whether it’s normalcy or the simplicity of expectation. The narrator talks about how “serene” and “clean” the wildness of someone can be; and to the right listener, it can be enough to really encourage the creativity and individuality this song calls for. “Nothing Not Really” feels like a resolution of many feelings, ending on a note where the narrator reminds herself of the importance of love and how fragile it is. This claim comes as “the only thing [she] learnt in a year.” This is not a happy song and it doesn’t feel like the narrator truly surpassed all her struggles, but it was not supposed to be about that. From the beginning two-song forward, Marling made clear that the album is about a bunch of thoughts, feelings, and events. Not all of them are ready to be resolved just yet. Still, this song makes it clear that love, even if it’s an “afterglow,” is one thing to keep strong. There is so much more in Semper Femina that needs to evaluated, and there could’ve been an analysis on every single song on this album. “Don’t Pass Me By” has a strong electric guitar chord that envisions a lost soul thinking of an old relationship. “Next Time” talks about impending doom that comes from folks not paying attention. It’s a thick album that focuses a lot on a narrator (it’s not clear whether the perspective is always, if at all, Marling’s) trying to understand strong emotions. This comes from her own thoughts on herself and those of other women. It’s not an easy album to listen to and it’ll take a lot of work to fully detail everything that Marling has written into this album. It’s not just a great album, it’s one that will stay on the mind for a very long time. LOVE IT.